The Yankee Rebel Tavern is a Mackinac Island restaurant. Warm, casual restaurant highlighting updated renditions of American culinary classics in a rustic, colonial setting. 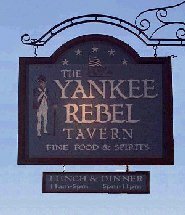 Take a video tour of Yankee Rebel Tavern. Open 10:30 a.m. to 11 p.m. daily.